By Timothy Potts, BA Hons. 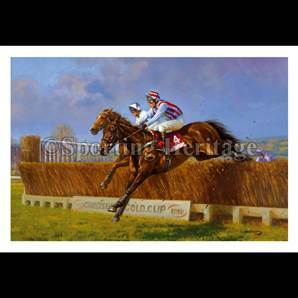 "Defining Moment" was originally commissioned to celebrate an historic triple Gold Cup success. 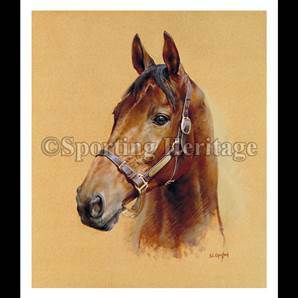 A unique tribute to the cherished memory of 'the people's horse'. We may never see his like again! 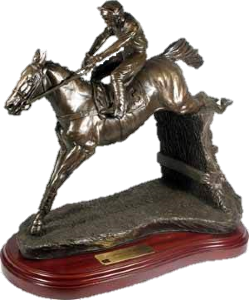 A limited edition of just 750 world-wide, "Defining Moment" is a cold cast figurine standing 13" tall and is hand finished by highly skilled craftsmen who fettle the reins and whip before polishing to produce a rich bronze patina. Excellent value at the issue price of only £445, plus £10 p & p, each sculpture is numbered and accompanied by a scroll, your Guarantee of Authenticity, signed by owner Jim Lewis. Approximately 10% of all sale proceeds will be donated to Jim Lewis' chosen charities, namely St Richards Hospice, Worcester and the 'Gentleman's Night Out' charity in aid of short-life children.